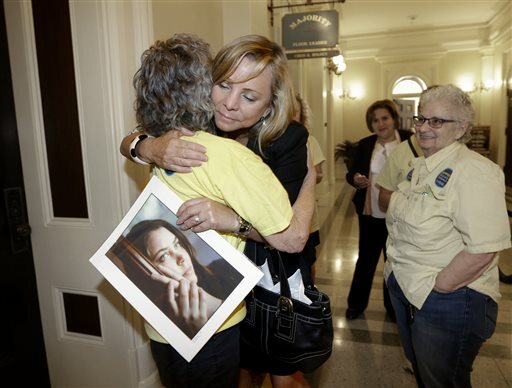 In this Sept. 9, 2015, file photo, Debbie Ziegler holds a photo of her late daughter, Brittany Maynard, as she receives congratulations from Ellen Pontac, left, after a right-to die measure was approved by the state Assembly in Sacramento, Calif. California will become the fifth state to allow terminally ill patients to legally end their lives using doctor-prescribed drugs after Gov. Jerry Brown announced Monday, Oct. 5, 2015 he signed one of the most emotionally charged bills of the year. The death-with-dignity movement took a giant step forward this week, with 38 million people coming under its umbrella in a single swoop when California Gov. Jerry Brown signed the End of Life Option Act on Monday. But the law still leaves out a wide range of people who might want to be covered: people with progressive debilitating diseases that don&apos;t have an obvious six-months-to-live prognosis and people with dementia, the fastest-growing health threat in the U.S. That&apos;s also true of similar laws in Oregon, Washington, Montana and Vermont. These restrictions might be necessary at this point in the history of aid in dying in this country, according to Judith Schwarz of the advocacy group End of Life Choices New York. "Opponents have many fears that such laws will be misapplied to the disenfranchised," she wrote in an email, and it&apos;s important to guarantee that for these groups — the poor, the elderly, the isolated — the "right to die" doesn&apos;t somehow morph into the duty to die "for the sake of others." Still, there&apos;s a problem with limiting the death-with-dignity option only to those with a prognosis of fewer than six months. 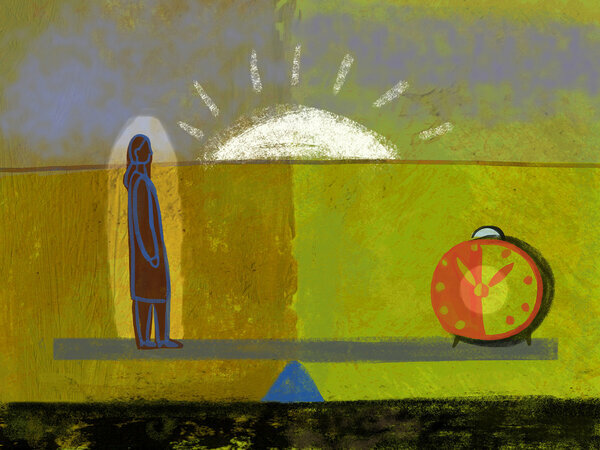 For one thing, prognosis is difficult, and studies show that doctors are actually overoptimistic in their assessment of how long their patients have to live. "Some doctors may wish to be more compassionate and not be as specific," Janis Landis, president of the Final Exit Network, wrote in an email, "and ironically thus deny the patient the certification that is required." 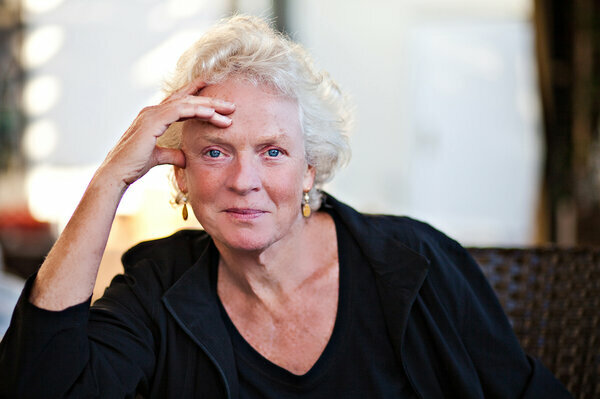 MacIntyre pointed out that people often change their minds at the last minute, and have every right to do so. In Oregon, he noted, about one-third of the people who obtained lethal drugs through the state&apos;s death-with-dignity program since 1998 ultimately decided not to take them. "The European safeguard is &apos;intolerable suffering,&apos; " said Margaret Pabst Battin, a bioethicist at the University of Utah. "It&apos;s not defined in terms of the time until death, and it does include people with ALS or other conditions that wouldn&apos;t fall under our laws, which don&apos;t say anything about suffering." A death-with-dignity bill introduced in Battin&apos;s own state tried to broaden the safeguards to include people with a wider range of illnesses. On the phone with me, Battin read aloud from theUtah Death with Dignity Act, introduced by Rep. Rebecca Chavez-Houk, which could apply to someone with an "intractable and unbearable illness," defined as "bodily disorder that cannot be cured or successfully palliated, and that causes such severe suffering that a patient prefers death." She said such broad language would no doubt be changed if the bill works its way through the state Legislature, as has happened elsewhere. But people with Alzheimer&apos;s disease and other forms of dementia are beyond the scope of almost all these laws. Schwarz said that maybe, very far in the future, there might be some way to cover dementia, but it&apos;s "so complicated" that she doesn&apos;t see it happening anytime soon. How, for instance, do you write legislation to deal with the question of personhood, which alters as the disease progresses? Is the demented individual — perhaps someone relatively content in her diminishment — "the same as the individual who so FIRMLY REQUESTED/DEMANDED lethal meds at a certain point in their future demented state?" Schwarz wondered. "And who are you going to get to administer lethal meds under such circumstances?" Schwarz spends a lot of time these days with Alzheimer&apos;s patients who want to choose the timing of their deaths. She said all she can offer them is guidance about stopping eating and drinking as a way to hasten the end. "It&apos;s a very, very hard choice to make when life still has pleasure & purpose," she wrote. But "the window can close" on a person with dementia, affecting the ability to refuse food and water once that person can no longer feed herself and caregivers enter into the decision.